The Bug Man carries a complete line of professional products for those who prefer to Do-It-Yourself We Offer FREE Pest ID and Professional Instructions. At our store in Gulfport, the Bug Man staff is proud to offer a wide range of pest control products for the do-it-yourselfer in addition to our professional pest control services. All of our pest control products are professional strength and EPA registered. They are the same products professionals use, and are only available through our licensed store. We also provide free pest identification, and will recommend the best and most effective products for your pest control needs. We offer expert instructions on how to use our products and advice on how to deal with your pests. We can show you how to eliminate fleas, ticks, ants, roaches, termites, bees, hornets and more. 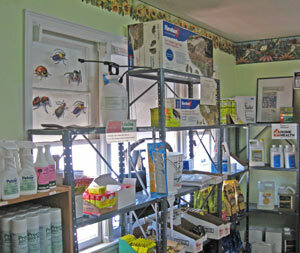 The Bug Man offers a wide range of pest control products for your home and your pet.